The most popular file format in the business world is the PDF. This digital equivalent of a paper document is being used for invoices, reports, presentations, marketing material, and everything else in between. With the right approach and knowledge, the ubiquitous Portable Document Format can be made compliant with ISO standards for archiving, printing, universal accessibility, and more. Also, one of the biggest perks of using the PDF is the fact that you can rest assured that every recipient will be able to open and view the file on any platform and device. Nevertheless, trying to edit a PDF can be a pain if you don’t have the right tools. There’s certainly no shortage of computer programs available for every task you might want to accomplish with PDFs. However, choosing the one that best suits your PDF editing needs can be bothersome. That’s why we’ve decided to help you. If you’re deciding on which PDF tool to use, Able2Extract Pro 12 is the option you should take into consideration. Aside from being able to edit PDF pages and content on the spot, Able2Extract can create, encrypt, and convert PDFs to other popular file formats for editing in a various text processor, spreadsheet, and presentation programs. The good thing about Able2Extract is that the developer didn’t opt for an increasingly popular subscription, monthly-fee based licensing models a lot of tools are using these days. Instead, you can have all of its features (including OCR and Batch conversion) at your fingertips for a lifetime with a one-time payment of $149.95. 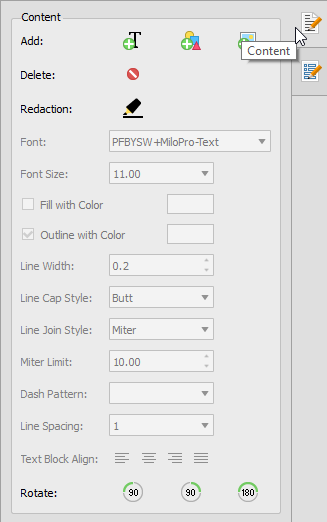 Without further ado, let’s dive into Able2Extract’s PDF editing abilities. Read more to find out how easy it can be to deal with PDFs without converting them to other formats. The first thing you should be aware of is that Able2Extract has two “modes”: Convert and Edit. By default, Able2Extract opens files in Convert mode. To get editing options to show on the right panel of the program’s interface, look for a big Edit icon in the Command toolbar. Alternatively, go to File-Edit or use keyboard shortcut Ctrl+J (for Windows and Linux) and Command+J (for Mac). 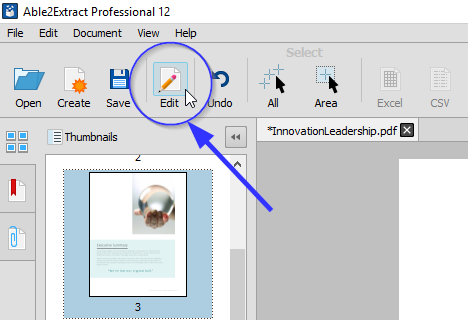 Once in Edit mode, you can start editing the content contained in the opened PDF. For example, to add or delete text, just double-click on the part of the book and the blinking cursor will appear. Start typing or hitting backspace/ remove to make changes. 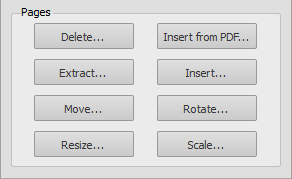 Below the Content panel, you can find the Pages panel with eight buttons for easy access to all PDF page editing features. In the thumbnails pane on the left, you can make a quick page selection and then click on the appropriate button in the Pages panel on the right to start making changes. By doing so, you can delete pages, insert pages from other PDFs, extract specific pages for PDFs, rotate and resize PDF pages, and more. The latest version of Able2Extract, version 12.0, came with quite a few new features, including the ability to edit PDF forms. To make use of this option, look for a PDF Forms tab on the far right, below the Content/Pages tab. 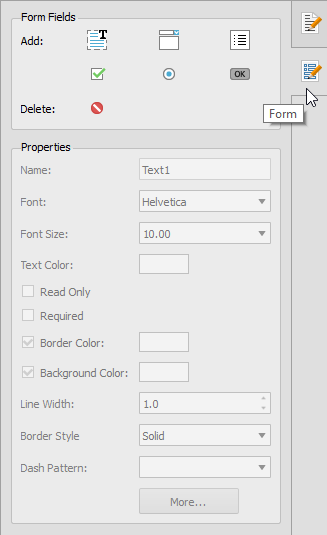 If you have a document with form fields already in it, just click on the one you’d like to edit and change its properties (for every type of form field there are different additional properties you can change when you click the More… button at the bottom of the Properties panel). To access additional properties faster, just double-click on the form field and the pop-up window will appear. To sum it up, this powerful PDF suite can help you update digital documents, repurpose them, and ultimately boost your productivity when it comes to dealing with PDF files. But don’t take our word for it, check it out yourself. If you have some PDF lying around that could use some editing, try Able2Extract free for seven days by downloading the trial version here.